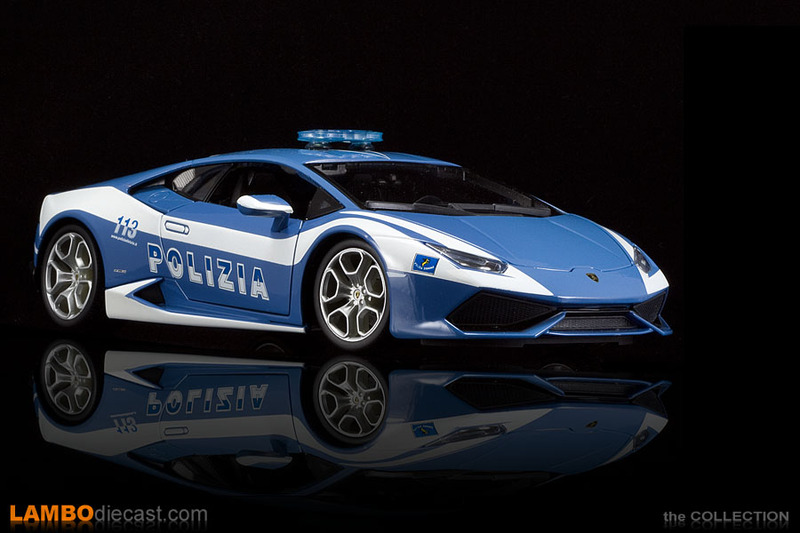 Even before the first customer cars of the new Lamborghini Huracan LP610-4 were delivered the Italian State Police received a brand new patrol car from Automobili Lamborghini SpA, just like the Gallardo, Gallardo LP560-4 and even a Nuova Gallardo LP560-4 ... the Sant'Agata company now offered another V10 Raging Bull to the Polizia di Stato. 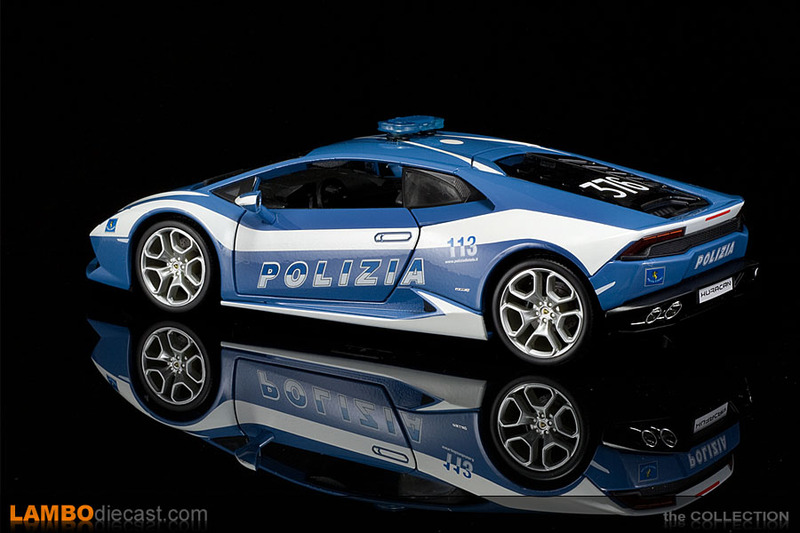 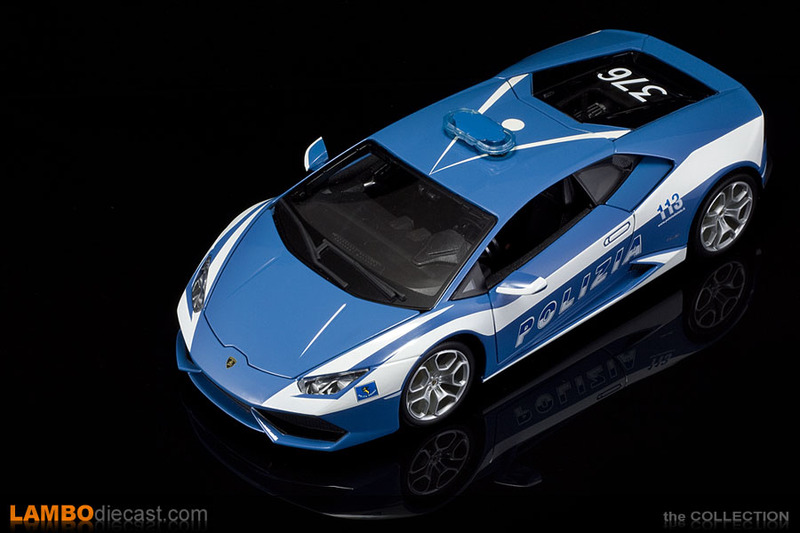 Now Bburago was the first one to offer a rather nice 1/18 scale model of the Lamborghini Huracan LP610-4 right at the Geneva Auto Show when the real car was unveiled for the first time ... and once again Bburago is the first one to offer this special Polizia version too, even MR didn't pick up on this one ... yet. 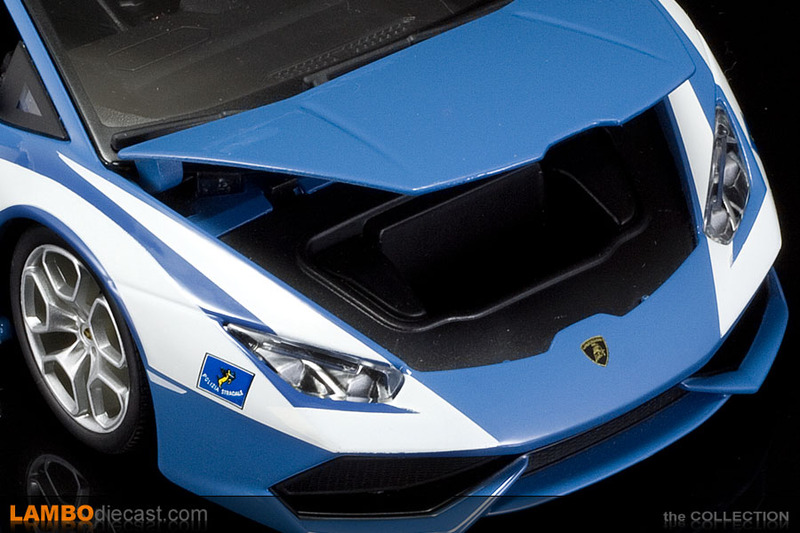 Now Bburago is a low end diecast model builder, we all know that, but with their Huracan model they are on the right track if you ask me, their scale is perfectly matched to 1/18 this time, unlike with their Aventador model which looks really good, but is more a 1/19 scale instead ... so it would fit into the regular Bburago box ... which is a shame if you ask me, especially their second release on the Aventador is a really good looking model for that price range ... and the Huracan is no different, I highly doubt we'll be seeing another builder doing a 1/18 scale model at this level for that kind of money. 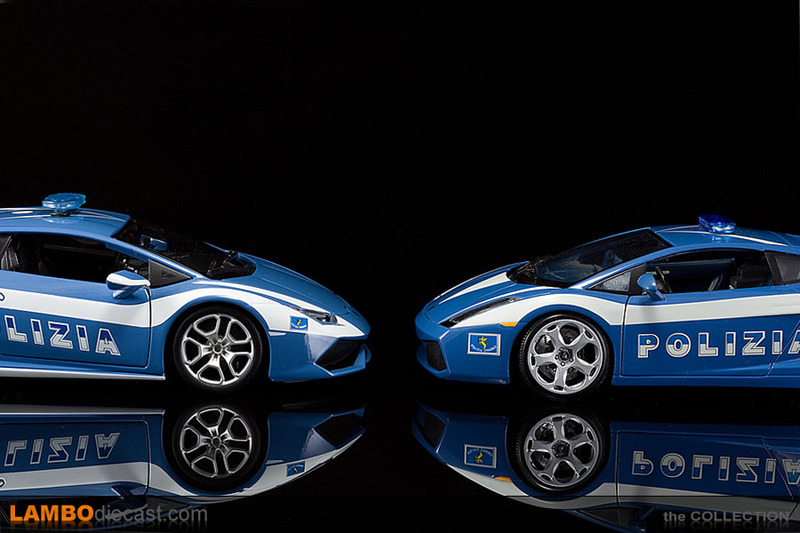 I for one am eagerly awaiting the new Welly 1/18 Huracan in fact, this model has been announced, and if the Welly Aventador is anything to go by, their Huracan might well be a very good alternative to the low cost Bburago ... and even the more expensive AutoArt model ... which we all hope will be built in the future. 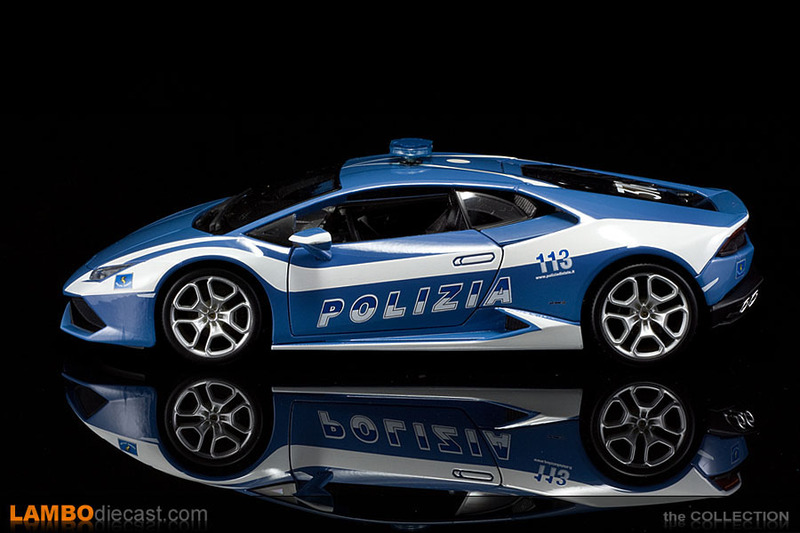 But now back to the Lamborghini Huracan LP610-4 Polizia, another high speed pursuit vehicle that will also be used for important organ transplant transportation ... hence the usual array of special police equipment has been installed onto the original Huracan, such as a real-time video monitoring/recording system to catch speeding drivers and show them their 'run' straight away on a removable display with a camera next to the rear view mirror. 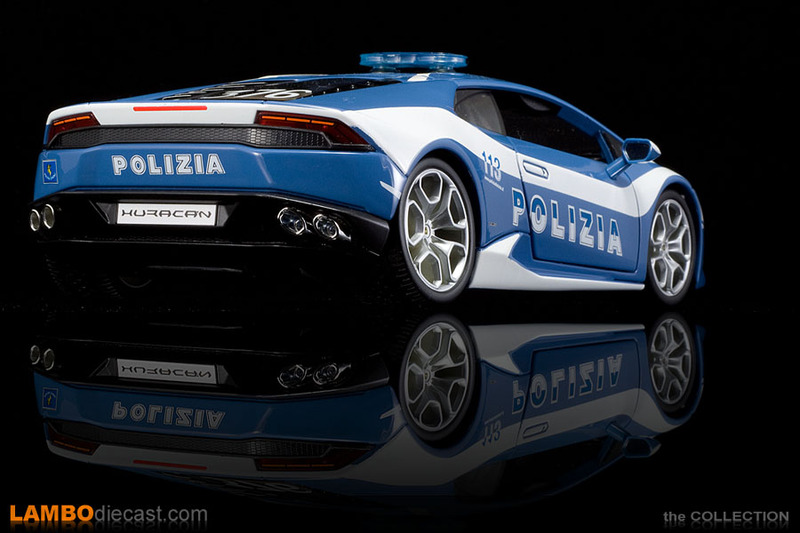 In fact the system is constantly coupled to a central database that checks license plates on the spot. 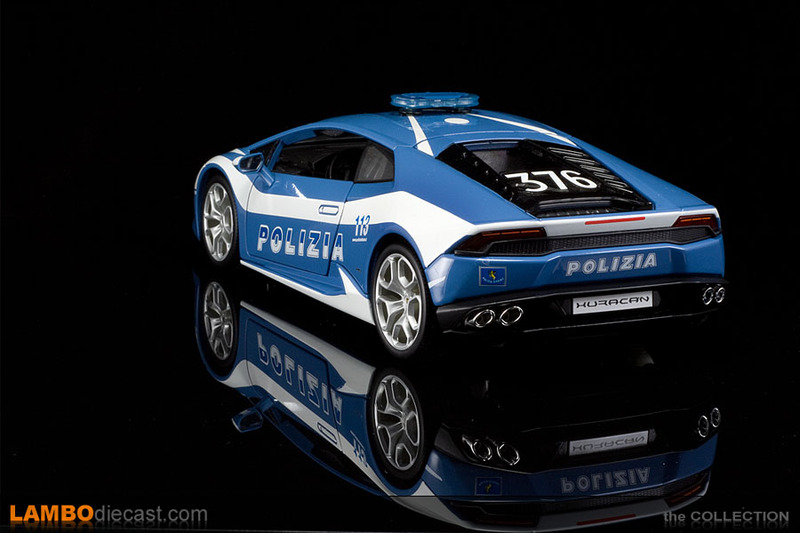 But also the usual police radio and a gun holster are present, together with the 'Paletta', the white plate with the red dot to pull over people on the road, while in the front luggage compartment a refrigerated box is installed for medical emergencies like organ transports, and there is also a life-saving defibrillator. 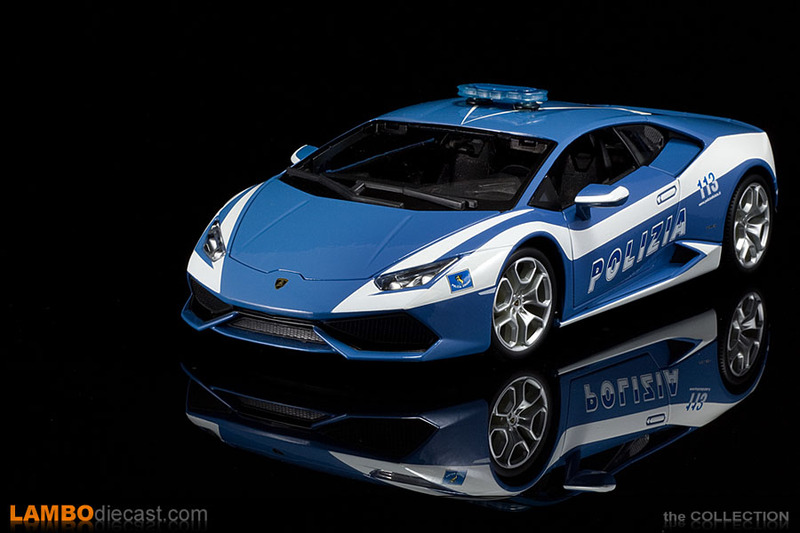 Even the light bar on the roof had to be designed to cope with the high speed this Lamborghini Huracan can reach, aerodynamically improved and coupled to a series of blue LED units ... inside the front air intakes, on the sides behind the rear quarter windows and inside the rear air vents ... add four sirens and you can't miss this car on the Italian highways. 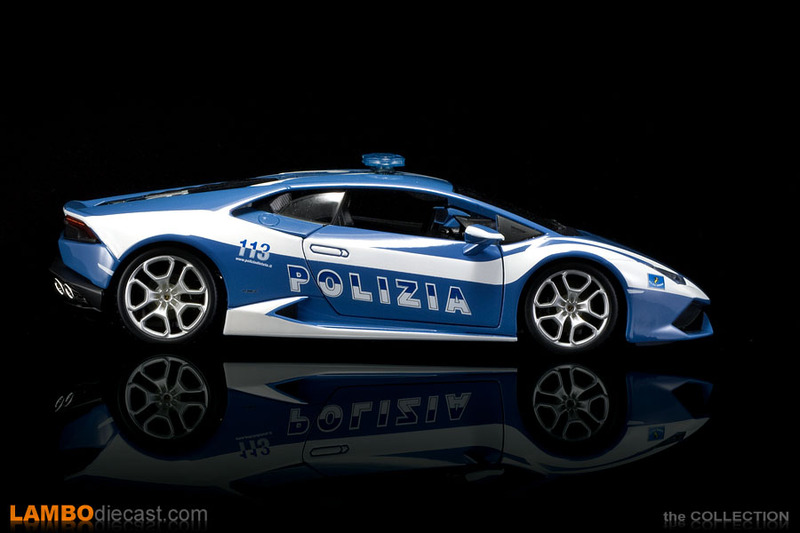 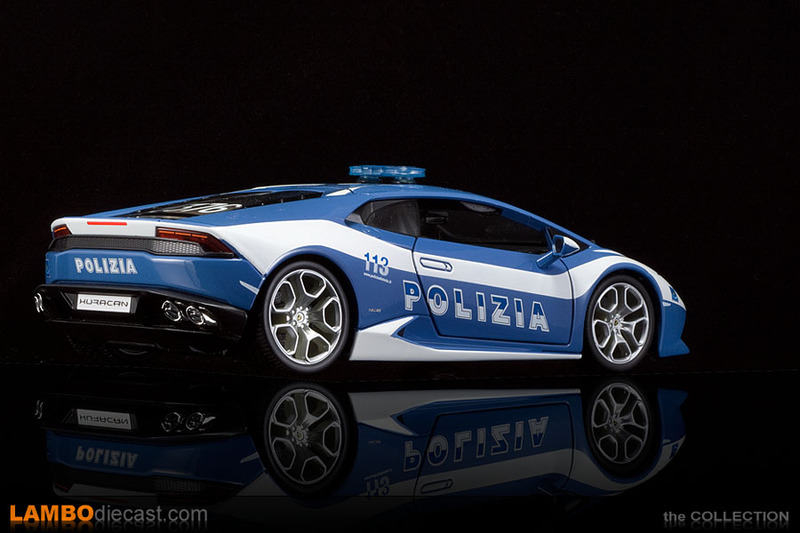 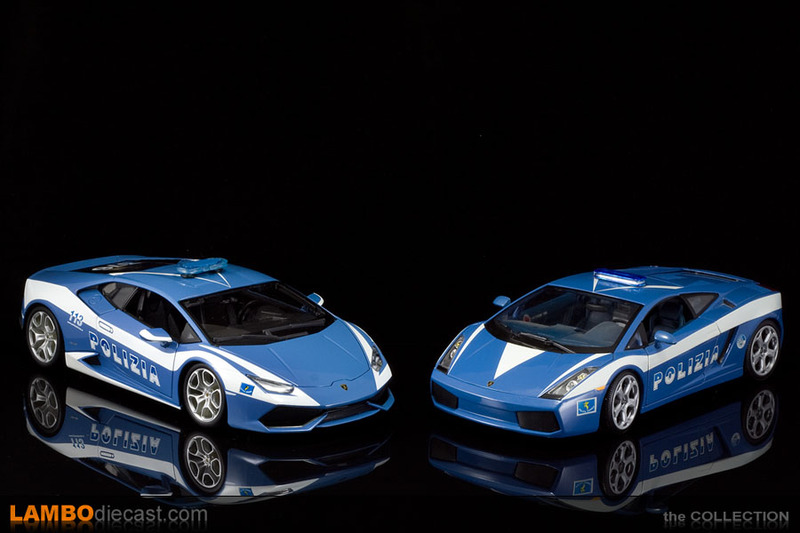 Now all the previous Lamborghini Gallardo 1/18 scale models on the Gallardo made by Maisto, Norev and AutoArt replicated these Polizia items nicely ... but on this latest Bburago made Huracan Polizia everything that makes this such a special vehicle is actually missing. 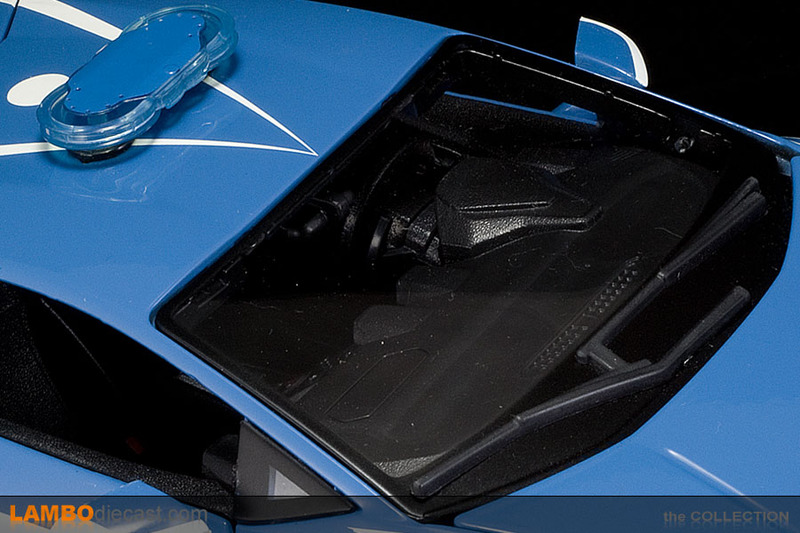 No special items inside this model car, just a plain black interior ... no camera, no displays or radio units ... and even under the front hood the luggage compartment is empty ... and that's not even the worst ... take a second look at the wheels: they are wrong! 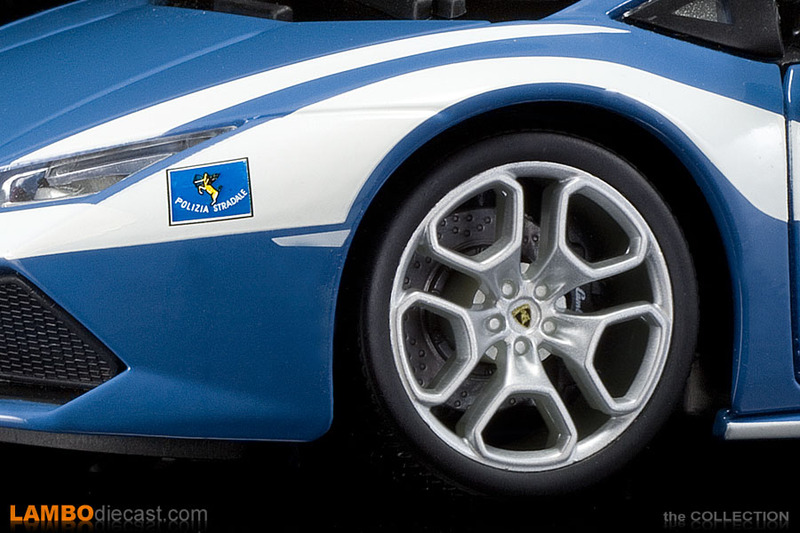 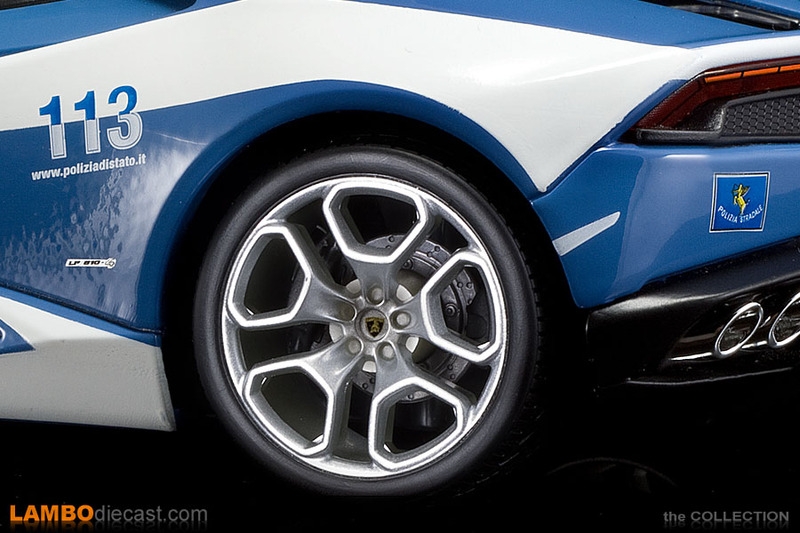 The real Lamborghini Huracan Polizia rolls on the optional Mimas, double five spoke wheels and received optional red brake calipers ... this Bburago model comes with the regular Giano wheels over black brake calipers, probably a cost cutting measure as Bburago released their regular Huracan model on these Giano wheels too. 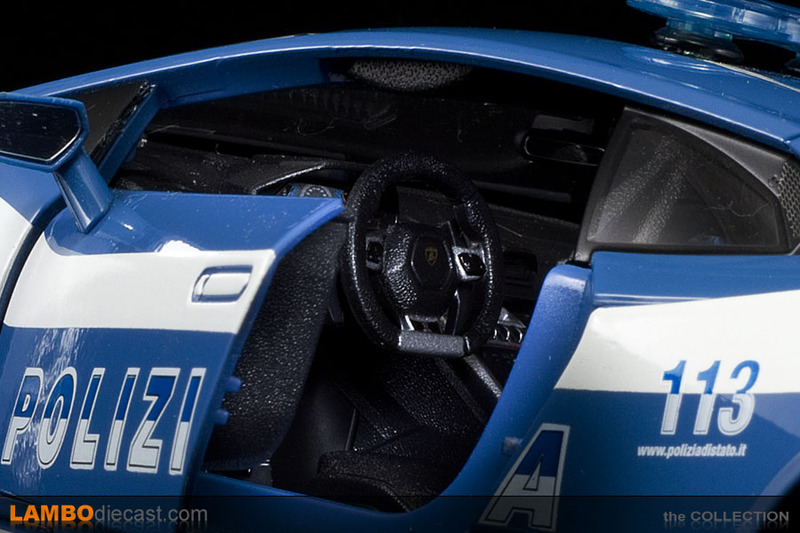 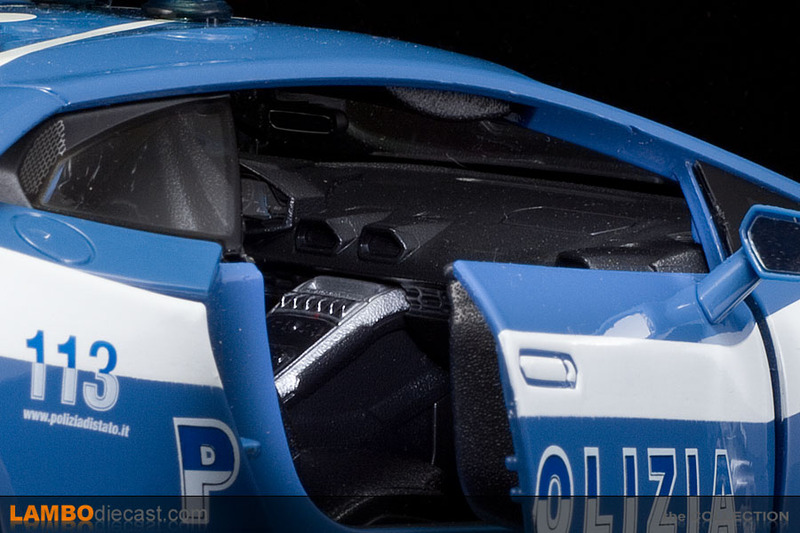 And there is another issue with this 1/18 Huracan Polizia ... the engine cover! 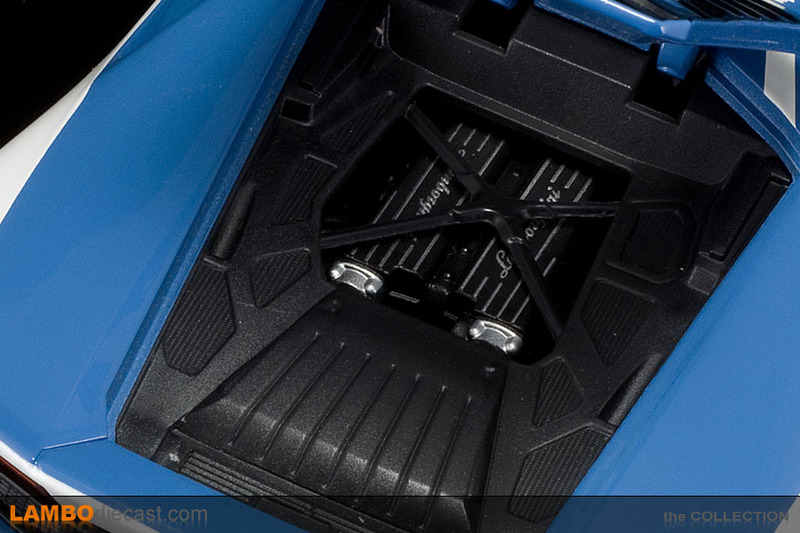 Sure it shows the 376 number in big white digits ... but on a glass engine cover while the real car came with the standard, black louvered unit, by the way, the real car received license plate H88662 ... just in case you were wondering. 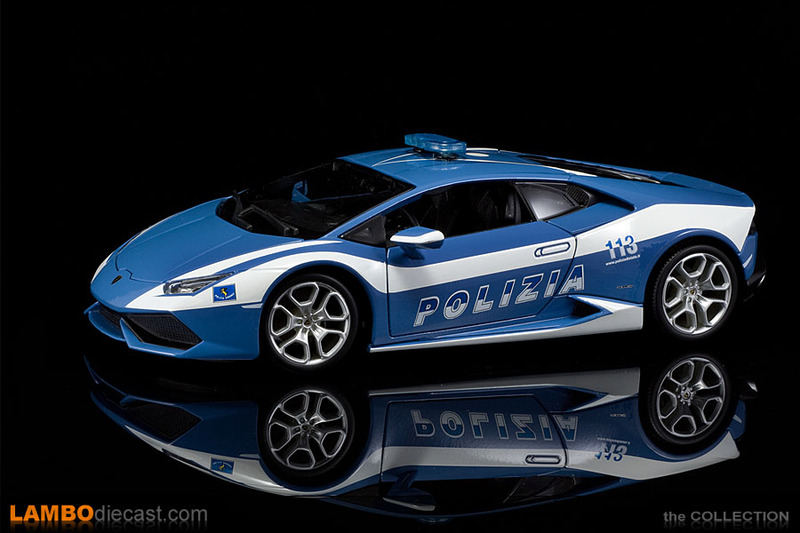 So yes, this 1/18 Bburago made Lamborghini Huracan LP610-4 Polizia has some serious flaws, but still at the price these are offered it still is a very nice addition to my collection, that is also why I got all four shades of the regular Huracan from Bburago too ... until a more high end manufacturer comes out with their version of the Huracan these will display nicely in my collection.